Additions to your hot tub can run the range from a few fun accessories all the way up to something that might just need a building permit. Everything extra you can do to your hot tub, like Hot Tub Gazebo’s for instance, means extra things you can do with your hot tub. We’ve talked about the more common kinds of accessories in other posts – things like water weights, pool noodles and that type of thing – so we won’t get into them in this post. What we will talk about are some of the more structural additions that can fundamentally change how you use your tub. Hot tub gazebos, umbrellas and other structures and additions can transform your hot tub. They can turn it from the thing in the back of your house to the heart of your home. The simplest change you can make to your hot tub is to install a hot tub umbrella. It doesn’t seem like this would make a big difference, but it certainly can. Especially in hotter, sunnier climates. There are really two options available when adding an umbrella to your hot tub: patio umbrellas, and hot tub umbrellas. Patio umbrellas can be a bit less expensive, but aren’t generally very adjustable. They stay in one place so as the sun move across the sky, the shade they throw moves across your hot tub. Specialist hot tub umbrellas are usually more expensive, but are designed to attach to the side of your hot tub and to be extremely adjustable. This means you are guaranteed to have shade where you want it, all day. Both options are equally proof against weathering and the elements. Make Your Hot Tub Area Look Awesome! There are many reasons to invest in a stylish, useful addition like a hot tub umbrella. From a purely aesthetic point of view, a hot tub with a nice umbrella just plain looks better than the same tub without. From a more practical standpoint, having a hot tub umbrella can actually save you money in maintenance and chemicals costs. If you’re using your hot tub on a sunny day, it is very important to use a nice, effective sunscreen. Lotions (including sunscreen) and hot tubs don’t get along very well. The addition of lotions, cosmetics and other skin care products to a hot tub’s water eats up the disinfectant chemicals. That, over the longer term, will result in more chemicals being added, and more frequent cleanings. That’s a lot more work, and hot tubs are supposed to be about relaxing. 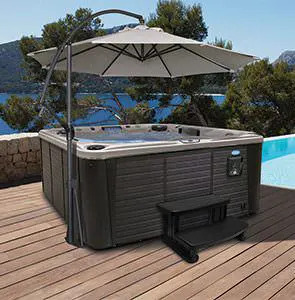 The simple addition of an adjustable hot tub umbrella means you can stay in the hot tub while staying out of the sun, you won’t need to wear sunscreen and your water won’t need more and more chemicals. Sometimes a bit of shade is all you really need to get the most out of your hot tub. Sometimes… sometimes you want a bit more than that. The addition of a gazebo or other structure can add a certain amount of shelter from the elements, but it can do a whole lot more than that, too. Hot tub owners often find that, after adding hot tub gazebo’s, their hot tub becomes much more a part of their home, and of their lifestyle. Gazebos come in a very wide variety of styles. Before settling on something specific, it’s a good idea to consider the different options and decide which of them you need, which you don’ t need but would like to have, and which you actually would rather not have. All that being said its a one time investment so go for the fences. 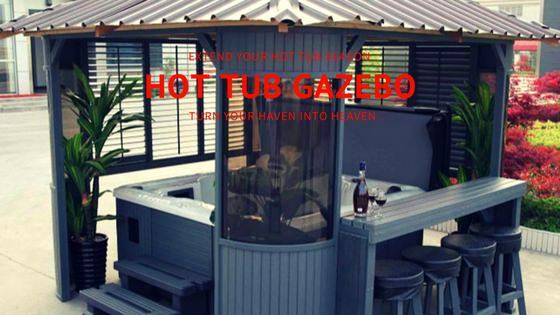 There are many designs and kits for hot tub gazebo’s today. You will want to stay with a gazebo made of composite materials for a number of reasons. The main reason of course is maintenance. With a cedar or wood Gazebo you are looking at refinishing and re-staining or painting semi-annually. With a composite Gazebo there is little to no maintenance other than hosing it down each Spring. The colors stay vibrant and it never breaks down where the wood counterpart needs to be replaced over time. The styling of gazebo’s has also come a long way, you can add a bar or a skylight, and enjoy any color you like. This one might seem like an obvious thing, but gazebos, unlike umbrellas, come with both open, latticed roof structures and closed, solid ones. If you want to use your hot tub in all weathers, a closed roof is a good idea. If you only plan to use the hot tub in clear weather, or if seeing the night sky from your hot tub is something you treasure, perhaps an open-roofed structure is more suitable. If you do plan to use the hot tub at night, building a gazebo is a great chance to install a lighting solution. What type of lighting will best suit your hot tub usage? What kind of lighting will open up new possibilities? Do you want spot lighting? Even coverage? Ambient lighting? Adjustable mood lighting? If you want to have cocktail parties in your gazebo, you’ll want different lighting solutions than if you plan to soak in your hot tub and read a good book most of the time. Putting up a new gazebo is a great chance to integrate whatever A/V equipment you would like to use. This might be as simple as a cheap projector and a hidden laptop HDMI cable, or as complex (and expensive) as a top end surround sound system with the latest, greatest, largest curved 4K screen money can buy. Your options in this area are almost unlimited. Believe it or not, you can actually get portable gazebos. Even more surprising is that they can look pretty darn good! A portable gazebo can be useful if you only want the extra shade and shelter a gazebo offers some of the time, and would like to be out in the open air the rest of the time. Going with a less permanent option removes some of your choices with regards to A/V and lighting, but sometimes flexibility is more important that other considerations. The advantage that all of these umbrella and gazebo options offer is a simple, but powerful one. They all give you the chance to tailor your hot tub experience to better suit your lifestyle – or even to suit what you want your lifestyle to be. They help turn your hot tub into one of the center pieces of the life you want to lead.